Barry Sibanda powers his way through the midfield. With both clubs not having a competitive match last Saturday, a friendly wasarranged at Barnetts Park. 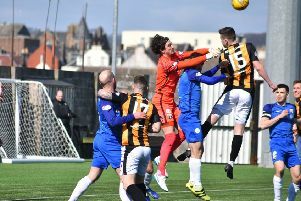 After they started the match on the front foot, the home team fell completelyout of it in the second half against their North league opponents. Barry Sibanda had three decent chances in the first 20 minutes, but wasunable to find the back of the net. North End opened the scoring after24 minutes with their first serious attempt at goal when Alex Gibb beat keeper Darren Clarkson from close in. Three minutes from the interval United came close to an equaliser whenBarry Sibanda headed a Sam Buchan cross against the junction of the barand post, with keeper Mark Mackie beaten. North End doubled their lead after 48 minutes, when a free kick from Gary Robertson on the right wing completely deceived everyone, and ended upin the back of the net. Ex Dundee player Lee Cameron completed the scoring for the visitors when he netted goal number three with half an hour left on the clock. St Andrews United - Clarkson, McNeish, McMullan, (Dobie), Mackie, (Rolland), Wedderburn, Brand, Trialist, (Brocklebank), Buchan, Sibanda, (Deane),Sturrock, Cunningham. The game and end resulty was of little consequence to Ian Barrett’s side who have bigger fish to fry. The club is still very much embroiled in a battle to preserve their Super League status but have been unable to chalk any points on the board due to free-weeks and cup ties. On Saturday United are away to Penicuik Athletic in the quarter final ofthe Fife & Lothians Cup. Kick off is 2.30 pm and penalties if required. The winners are away to Kelty Hearts at Central Park in the semi final on a date to be announced.